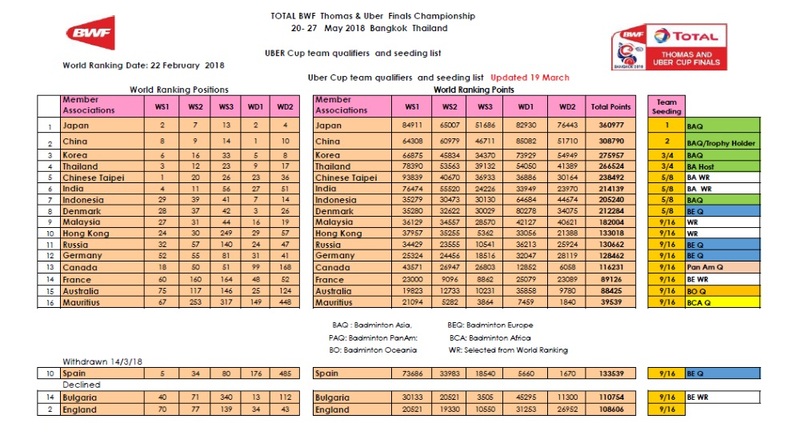 Hong Kong’s men and France’s women qualified for the TOTAL BWF Thomas & Uber Cup Finals 2018 due to the withdrawal of England and Spain respectively. Spain, one of the original qualifiers for the Uber Cup, withdrew due to injury concerns to some of their players. The teams next in line for qualification by virtue of World ranking – Bulgaria (110,754 points) and England (108,606 points) – declined their invitation, which was accepted by France (89,126 points). France will be seeded 9-16 for the draw alongside Malaysia, Hong Kong, Russia, Germany, Canada, Australia and Mauritius. England’s Thomas Cup team’s withdrawal today opened the door for Hong Kong, who were next in line with combined World ranking points of 199,152. Hong Kong will be seeded 9-16 with Thailand, Russia, Germany, France, Canada, Australia and Algeria. The draw for the Thomas & Uber Cup Finals (20-27 May 2018) will be conducted on Thursday 22 March at 6pm in Bangkok. The draw for the 32 teams – 16 each in the Thomas Cup and the Uber Cup – will be held at Arnoma Grand Hotel in the presence of special invitees, officials of the Badminton Association of Thailand and media. The top seeds in Uber Cup (Japan; 360,977 points) and second seeds (China; 308,790 points) will be placed at the head of groups A and D respectively, while the 3-4 seeds (Korea and Thailand) will be drawn by lots into Group B or C. The remaining teams, seeded 5-8 and 9-16, will all be drawn by lots. A similar procedure will be followed for the Thomas Cup, in which the top seeds are China (374,916 points) and second seeds are defending champions Denmark (320,038 points).